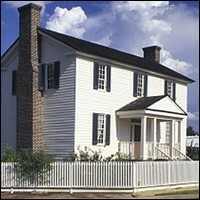 The Root House Museum is an excellent place to begin a visit to picturesque and historic Cobb County. The Greek Revival house stands just two blocks from its original location, and it is one of the oldest surviving frame houses in Marietta. Visitors can tour the house, walk among the flower beds and vegetable plots filled with plants available in Cobb County before 1860, and shop for historic books and gifts in the museum store. Parking: Free parking is available in the lot and on the street.